Adega Mãe born of an old passion that has always existed within the Riberalves Group: the wine. Located in Quinta da Archeira, in the Parish of Ventosa, has an area of approximately 40 ha. (98 ac.) devoted to vines and a production capacity of 1.2 million litres per year, thus giving rise to a full range of wines. Framed in the extraordinary landscape of the West, presents unique wines influenced by the Atlantic climate and the clay-limestone soils. Adega Mãe is a temple erected to wine and the worship associated with it. It is discerning and demanding on the moment of producing/selling and available and opened when the moment of sharing arrives. It is a Cellar of the future, equipped with the most advanced media for an optimal production regarding its resources. Aware of the nobility of wine, respectful of its tradition and committed to nourish their origins. The vineyards, with an area of 30 ha (74 ac.) are located in the area surrounding the cellar. On gently sloping hillsides, the vineyards grow in clay-limestone soils influenced by the Atlantic climate. The grape varieties were selected according to their adaptability to the region. The Adega Mãe has currently 50% of the vineyard with white varieties. Sauvignon Blanc, Chardonnay, Arinto, Viosinho, Viognier, Riesling and Alvarinho. The other half has red varieties: Aragonez, Caladoc, Alicante Bouscheta and Syrah. The members of the oenological team of Adega Mãe are the oenologists Anselmo Mendes and Diogo Lopes. They are both graduated in Agronomy by the Institute of Agronomy and postgraduates in Oenology by the Portuguese Catholic University. 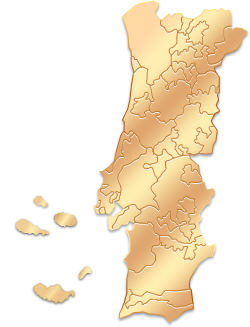 They work together since 2004 in different projects regarding the Portuguese wine. Anselmo Mendes began his career in 1987 and his professional career led him to work in almost all regions of the country: Verde Wine, Douro, Dão and Alentejo.Diogo Lopes started his professional activity in 2004 after an internship in California, where he developed his knowledge with new technologies and practices. With an innovative infrastructure and the cult associated to wine, Adega Mãe carries out original and different activities. A place where you can buy the products produced at Adega Mãe, as well as a full range of accessories related to the world of wine. Room with capacity for 120 people, suitable for all kind of events: corporate events, private parties, lectures, seminars and others. Room with capacity for 120 people, for trainings and workshops. Auditorium with capacity for 30 people, fully equipped. Located in Quinta da Archeira, on the Parish of Ventosa. GPS: N 39°02'55.7", W 9°17'45.0"
For groups larger than 25 people we might have to divide them into two or more groups. Adega lindíssima e moderna. Fomos muito bem recebidos e o nosso guia soube dar uma explicação ao pormenor, reservamos a visita Dory Colheita e a prova foi excepcional. O vinho é óptimo e a visita recomenda-se.